Running a business is never easy. No one knows this better than Jaclyn Johnson, author of WORKPARTY and CEO of Create & Cultivate, who made a million-dollar mistake as a young entrepreneur when she and her business partner, Amanda, suffered a communication breakdown. Now, Jaclyn shares 6 takeaways from her own experience as advice for starting a business. Your Reputation Is Your Résumé. Spend the early part of your career building relationships. They don’t need to be with top dogs or CEOs, but rather, start with the people around you. Be good to them. Work hard with them. Become the worker that they suggest to clients when they move on to a new job. Without your reputation, you have a piece of paper. And what good is that? There’s a reason it’s called net-work. Life is a group project. If you don’t know where to start, send out an email. It killed me to send the email saying that I was open to freelance work and taking on clients. But sit down, write the email, be humble, and reach out to the people you know who can help. It will come full circle. When someone doesn’t put their word in writing, there’s a reason. You can’t produce a handshake in court. You can’t file a motion against a hug. Get everything in writing and notarized. No matter how small or seemingly trivial the deal point is, without a paper trail, you’re not getting that paper. Read the Whole Contract (and Understand It). Do you know what an operating agreement is? We had a 50/50 LLC, but we didn’t have an agreement clearly setting out respective responsibilities. You should have an operating agreement that may change over time and that clearly outlines the roles you and your partners play in the business. Our agreement didn’t say anything about her being in charge of the finances. If you don’t want to pay attention and learn the words you don’t understand, you’re going to go down at one point or another. Take Your Creative Project Seriously. Without Some Notes on Napkins, I would have found myself in a much more precarious financial situation. Luckily, I had taken my blog seriously from day one. I created my own spreadsheet and had multiple revenue streams that helped me and continue to help me. If you’re spending time on it, it’s worth treating like a real business. Learn about Your Relationship to Money and Have the Hard Convos Early. Amanda and I should have had conversations (that we then put in writing) about what is considered a business expense and what is considered a personal expense, but I avoided that for two whole years. And as someone wisely put it, I learned what could have been a million-dollar lesson for far less. Painful, nonetheless. 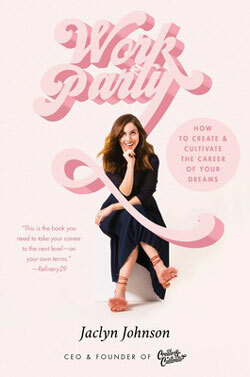 For more advice on how to run a business, check out WORKPARTY by Jaclyn Johnson.